Never be without the correct size Tap Wrench. This 3-pc. set includes T-handle wrenches in the following size ranges: 1/16" - 5/32", 5/32" - 1/4" and 1/4" - 1/2". 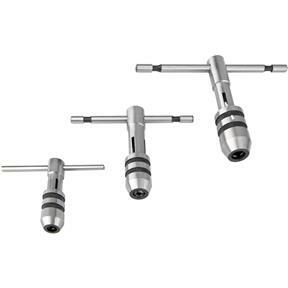 Knurled collets hold round and square taps and sliding handles provide plenty of torque. Having the right Tap Wrench when you need it is wonderful. Tap & Die sets only come with the small one. Good Deal.